Hey it’s me–Karen–signing in from Michigan where we have LOTS of snow and ffffreeezing cold weather. I decided I can’t take any more grey!! So I gathered up as many bright colors as I could find, and all of my black and white. Since my stash here is limited, I know I’ll need the shop to send me MORE (hint, hint)! I’ll try not to make this too tedious, but in case you want to join me making a liberated quilt, I’ll do a little step by step to help get you started. 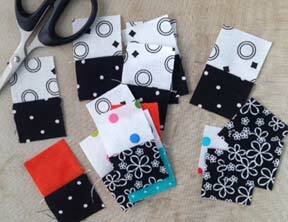 You’ll need lots and lots of bright fabrics–even small scraps can be used–and some black and whites. Try to choose fabrics that are pure color. In other words, they don’t have any grey in them! I like lots of pieces and lots of colors. Freddie Moran once said, “Ten colors don’t go together, but 100 do,” and I take that quote seriously. Since I know that I’m going to improvise as I go, and I won’t have a definite plan, it helps to cut lots of 1-1/2″ squares to use as starts and stops. I’ll use them later for checkerboard spacers. I like house blocks, so I decided to make my first block a little house. First I chose a fabric for the house and the door. I purposely cut two “wonky” rectangles for the sides, and made a strip with the yellow door. Then I auditioned some fabrics for the roof and sky. I liked the bright orange so I decided to add that for a chimney. Warning: I “waste” a lot of fabric in this process. It’s easier to cut big, and trim back to square things up. So I cut a large triangle for the roof, and generously cut a larger shape for the left sky. Then I cut the left sky apart so I could insert a strip of orange for the roof. Next, I needed a piece for the right sky. I used the same print for the sides of the house, and I sewed a strip to each side. If you don’t have enough of a white print, just use another fabric that has a white background. Next I had to trim the bottom of the house and the roof piece to give them both a straight edge. I adjusted where I wanted the roof to sit on the house, then sewed the pieces together. Lastly (at least for today), I trimmed the block sides–but not too tight. I may trim off more later, and I think I’ll add a “hill” later, so I didn’t trim the bottom. I’ll make more house blocks later. Want to join me? Go gather your fabrics and come back soon! I’ll post my progress as I go. If you’ve been in Quilt Expressions, you’ve heard the gentle, continual hum that comes from the long arm side of the store. 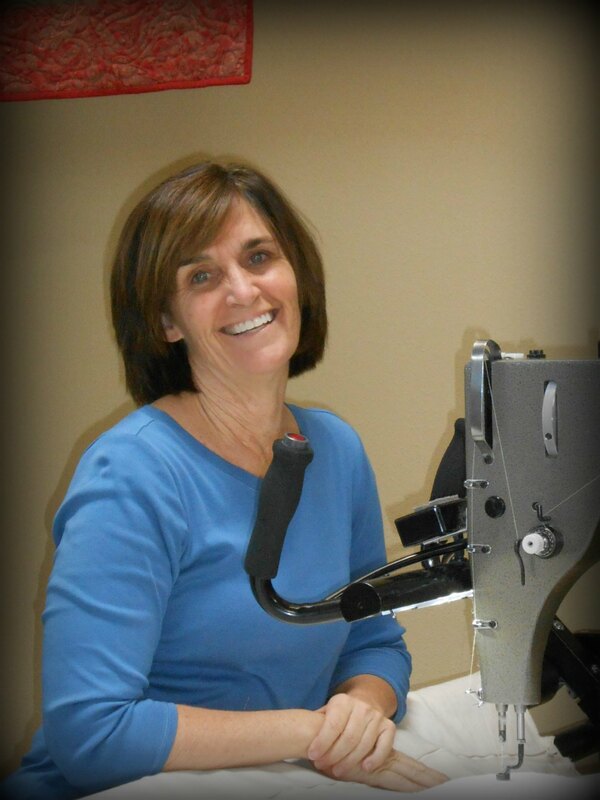 We have four Gammill Long Arm quilting machines that are available to rent by those who have taken our long-arm class and a Statler Stitcher that is operated by staff only. Keeping this beehive of activity operating smoothly is a team of talented quilters…..Tracey and Rodi. (Read about Rodi here). Let’s get to know Tracey a little better. My mother taught me how to sew clothing when I was about eight years old. Her standard was that the inside had to look as good as the outside. I learned on an old treadle machine and then used an old black Singer Featherweight. I have six kids and two grandkids. One of my favorite places to hang out with the family is Lake Powell. We enjoy wake boarding. 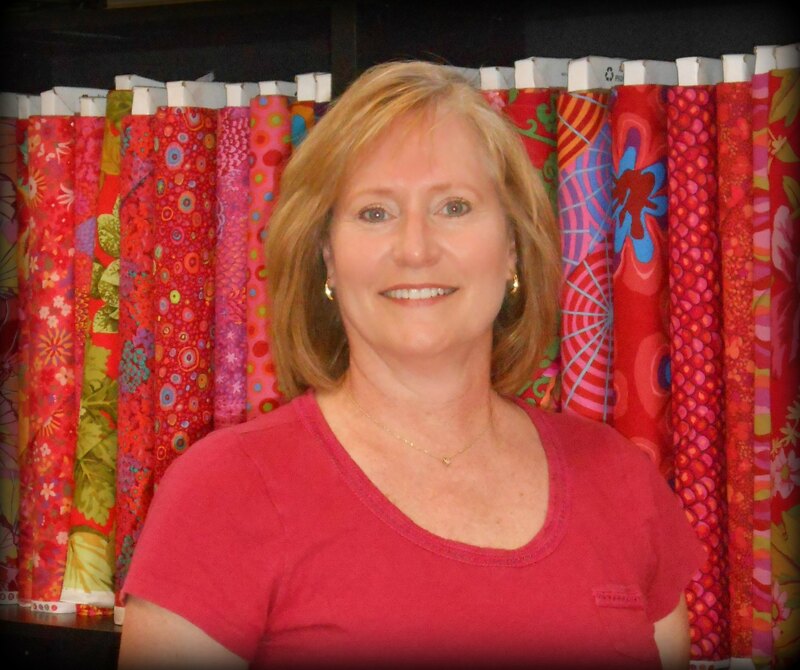 I started working at Quilt Expressions 3-4 years ago. I took a long arm class at the store and bought my own long arm two weeks later. Do you enjoy quilting others’ quilts? I love quilting our customers’ quilts. It’s so fun to see all of the possibilities. I also love both watching and helping customers quilt their own quilts on the long arms. What is your favorite type of fabric and pattern? 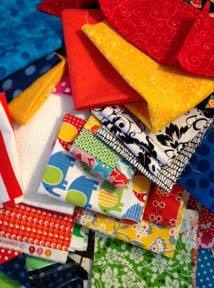 I don’t have a favorite type of fabric or pattern…I like them all! I am inspired by people and my surroundings. I am working on two scrappy/stash quilts from my own pattern creation. I am also working on a Quilt Expressions kit. I had hoped it would be done by May 2013 to be my couch quilt. I just need to sew the blocks together and add the borders….maybe by May 2014? 1. Be sure to stay stitch/baste all the way around the quilt. 2. Measure through the middle for your borders. 3. After it’s quilted and bound ~ wash it, wrap up in it, and enjoy it! I lived with my grandparents during the summer months from when I was seven until I was fifteen years old. In our cherished spare time, my grandma taught me and my sister how to make templates out of cardboard, then draw around them on the fabric. 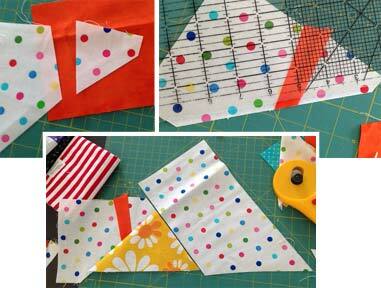 Next, we’d cut out the quilt pieces with scissors. Finally came the sewing machine and teaching us how to sew a straight line. If my grandmother were alive today, she would love the rotary cutters and the hours they save. I am married to a great guy named Brett, and we have two wonderful children. Brandon (soon to be 20) and Ali (who is 16…some of you have probably seen her in the store on the first Saturday of the month). My family is the most important thing in my life. In my limited spare time, of course, I piece and long arm quilt. I also love to travel and spend time with good friends. I love to read, even though I don’t seem to have much time for it anymore. I love to play Sudoku and put together puzzles when time allows. I also like to work on home projects. Something about me that might surprise you is that I used to compete in triathlons. I have been working at Quilt Expressions for seven years. I took the second long arm class that Karen offered when she had the store over on Broadway a little over seven years ago. I was hooked! I couldn’t get enough of it. Yes, absolutely! I love seeing the different colors and patterns that people use in their quilts. We are all so different with the colors we use. Every day I get to see (and touch) a new quilt. How much better can it get than that?! What is your favorite type of fabric and your favorite pattern? I definitely go for the bold and brights, most of the time. And so far, my favorite pattern is “Spin Cycle.” My second favorite quilt pattern is not really a pattern but a wonky way of creating blocks so every quilt is different. I was inspired on a recent trip to Seattle when we went to the Chihuly showroom. His colorful glass works of art inspired me to try to make a “Chihuly” quilt. I am still working on how to do it, but someday I will. Also, the modern quilts inspire me and makes me want to both design and sew a few. 1. Make sure both the quilt top and back are square. 2. Your quilt back and batting need to be at least 4″ larger than your top on all sides. 3. It helps if your borders aren’t wavy and full. If you need help on how to put on borders, we will definitely help you! 4. Make sure your seams are as flat as possible and well-pressed. 5. Be sure to remove all of your selvage before using your fabric. The selvage is woven much tighter than your fabric and won’t shrink at the same rate.